As an account manager, I have the unique pleasure of intimately serving our Verblio (formerly BlogMutt) Complete customers in their content creation and digital marketing. I personally get to listen to the stories and struggles both that business owners face. Which is where I got the idea for Owner Built Design. And in my nine years of experience in digital marketing, one of the most common obstacles I hear is the lack of traffic generation. In fact, HubSpot reports that traffic generation is a top challenge many small businesses and marketers confront in their marketing. So when working with my customers, my goal is to help them overcome this challenge and take their content strategy from struggle to success…from bland to BAM! By honing a consistent blogging cadence and creating spot-on content that resonates with our customers’ target audiences, customers working with me and other Verblio Complete account managers have witnessed better website traffic, engagement, online visibility, and sales as a result to the smart, better aligned new strategy. And we have the stats and testimonies to prove it. 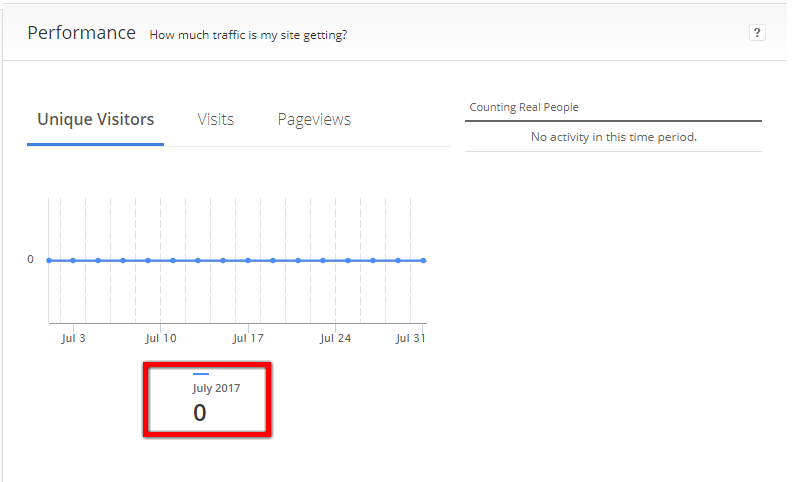 In fact, one of our customers reports that about 80% of his sales are coming from his increase in traffic generation. Meet Jim at Owner Built Design. 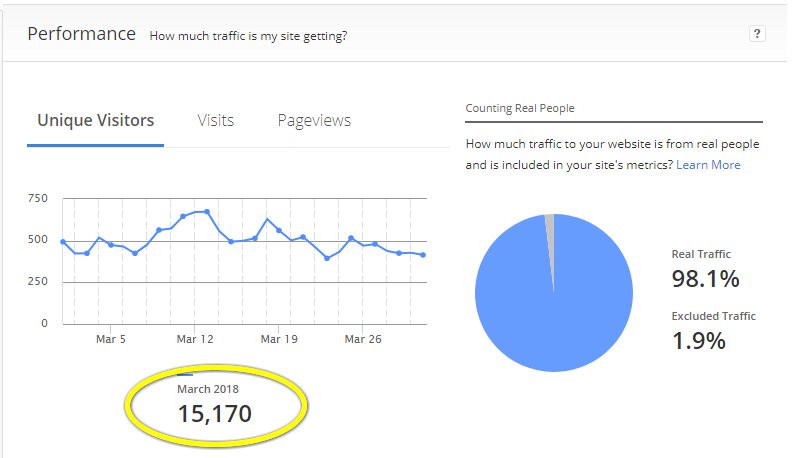 As a result of leveraging Verblio’s content writing services and then fueling his efforts through Verblio Complete (which includes working with an account manager like me), Jim has skyrocketed his website traffic from zero to yielding over 15,000 unique monthly visitors in less than 9 months. From bland to BAM! 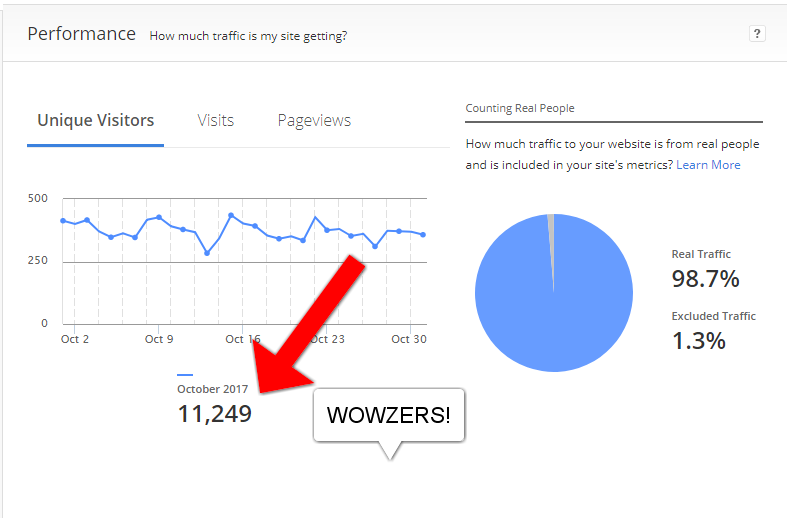 The impact this level of traffic is producing for his business monthly is extraordinary. More customers, revenue, and profits. Further, as many business owners believe, Jim knew he had a unique, competitive service that would be a game-changer for his industry. He just had to get it in front of the right audience using the right content his readers would love. So, just imagine what those numbers could do for your business. I’m here tell you how to do it! Read on to discover how Owner Built Design used smart, targeted content to power their brand and find new customers. But First, Who is Owner Built Design? Jim Kane is the man behind the brand. Owner Built Design provides residential design and drafting services mainly to homeowners who reside on the beautiful island of Oahu, Hawaii. The company takes on small projects such as home additions, remodels, and accessory dwelling units (ADU), occasionally designing homes a few times a year. As a small business-owner operating part-time for 30 years, Jim recently took the leap and transitioned into a full-time venture. Based on his success so far, one could easily say that the decision is paying off. His customer base continues to grow as more homeowners reach out to him regarding his services (more details on how they’re finding him soon). Mr. Kane was awesome to work with. He communicated with us regularly, leaving nothing to the imagination. Communication was key for our peace of mind to know that things were being handled. I highly recommend Mr. Kane if you’re looking to build or remodel your home! 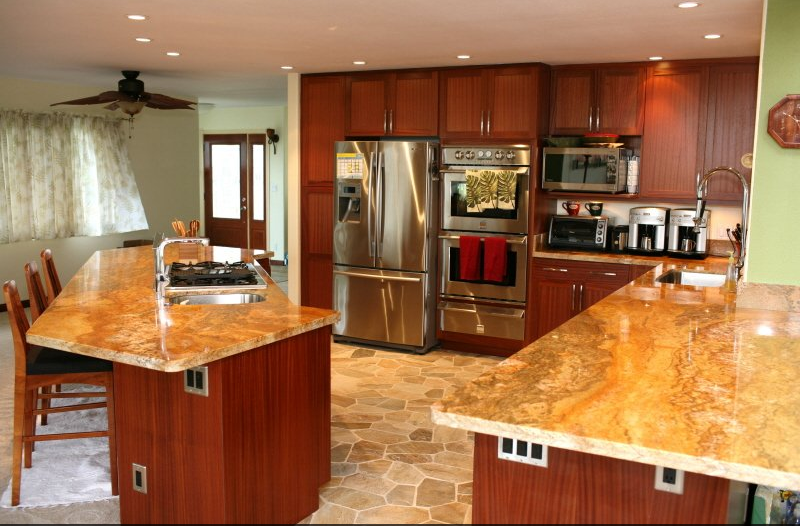 In fact, here is an amazing kitchen renovation design drafted by Owner Built Design featured below. The positive raves and reviews are a testament to Jim’s continued and sustained success with his customers and business. Because he is a forward-looking, modern small business owner who knows that his hustle for customers goes well beyond in-person interactions, more residents of Oahu are able to find and use Owner Built Design via search and social media for their desired homebuilding project. When making the transition into a full-time business, Jim knew he would have to take a different approach in his marketing tactics from traditional methods. What worked ten and even five years ago may not be effective today in his industry, which he painfully found out the hard way. In fact, just to test this theory, he initially ran a newspaper ad for an entire month to promote his services. “It failed horribly,” Jim shared. He confessed that he didn’t receive one phone call, lead, or interest from the ad. Instead, he heard crickets. A sound only confirming his original suspicions of relying on traditional, outbound techniques to create results. However, he was intimately familiar with the importance of blogging and having a strong digital presence. His involvement in a network marketing company that was predominately promoted online gave Jim some key insights into how today’s brands were marketing. Jim was keenly aware that brands were using their blogs to communicate and get their message out, to increase awareness, connect with their audience(s), and share educational value without blindly promoting their businesses. What really intrigued Jim during this time was the ability to monitor the analytics and see the data progress and trends over time. It was interesting to watch how you could change your ratings in Google through certain aspects and things that you do. So, I knew it [blogging] was important and worked! And this was the same marketing approach Jim wanted for Owner Built Design: a consistent blogging cadence where he would offer educational and information content to his existing and potential customers while cementing his brand as an authority in residential drafting services. He knew that the more people he attracted to his website, the more Google would favor his pages with higher rankings. You see, a big advantage Jim had over his competitors was that the majority of them were not blogging. During his competitive analysis, Jim realized that many simply had a website, but no activity. Alexa.com revealed invaluable data on his competitors such as their website ranking, which keywords they were using and ranking for, their website and social media engagement, which websites were linking into theirs (if any), and so forth. As a result, he learned that they relied predominantly on paid advertising to grow their business. Focusing on just one marketing tactic is a big disservice for brands seeking to expand their reach and influence because you miss a huge market of followers that are perhaps hanging out elsewhere. Putting a lot of “eggs,” or money, into one basket is limiting. Therefore, this positioned Owner Built Design to easily separate the company by providing useful information to homeowners of Oahu using organic search and social media opposed to paid ads. Blogging would give Jim’s brand the edge in an ever-evolving digital era where valuable content still reigns as king, especially in industries with few content pioneers like Jim. So, like many small business owners who receive a revelation on a working marketing strategy, Jim went for it! He’d done all the market research, competitive analysis, and with his website ready to go in May 2017, he started blogging. The bad news is, he simply didn’t have the time to crank out precious content on a consistent basis. He wasn’t a skilled writer. Although he had great topic ideas, fleshing them out into full articles wasn’t his strength. So he struggled with creating quality content that would make him stand out. Attempting to write and publish content took time away from his real focus and strength – the drawings. He really enjoyed designing new homes or home additions for his customers, but not so much when it came to writing. Finding compelling images and optimizing his post for SEO simply wasn’t his thing. Jim knew it. As a result, website traffic for Owner Built Design was at a low…zero! To realize his goal of organically attracting visitors to his website and be the resource who shares valuable content to his niche audience, Jim would have to leverage a content creation company to get the job done professionally. Welcome to Verblio! Well, maybe not that quickly. After a simple Google search of blogging services, he tried one company but didn’t enjoy the experience. Their services weren’t comprehensive enough to meet his needs (i.e. no search optimization) and was a bit expensive. Jim searched again and, on the second try, started with Verblio. And he hasn’t looked back! Before I began working with Jim through Verblio’s managed plan, Verblio Complete, he signed up for our content-only plan towards the end of July 2017. Now, through our content-only “basic” plan, customers have access to a network of writers that help fulfill their content creation goals. Therefore, Jim posted topic ideas and, based on their background and interest on the subject, writers would freely fill up his queue with quality-rich content for his review. If he liked it, he’d gladly accept the article and post it on his blog. If it wasn’t up to par, he’d have the option to ask the writer to revise the article to resubmit or decline the article altogether if it was too far off-base. Indeed it was, and Jim had a handle on it! 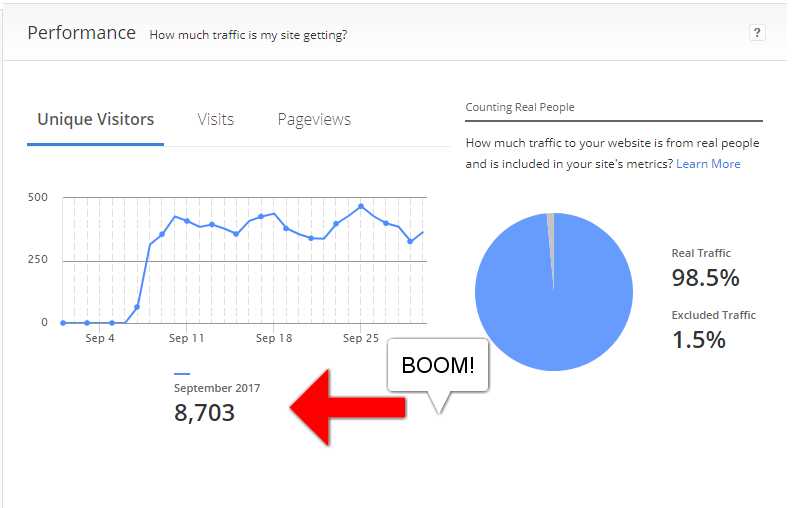 Although the first few pieces of content posted yielded only minimal results in August, the following month in September took an extraordinary leap in website traffic. Before looking at the following charts and dropping your jaw, we have a disclaimer to make: blogging is a long-term strategy that fosters consistent results with time. These fascinating results are not promised but are incredibly possible with a strong content strategy. And the results continued to climb. 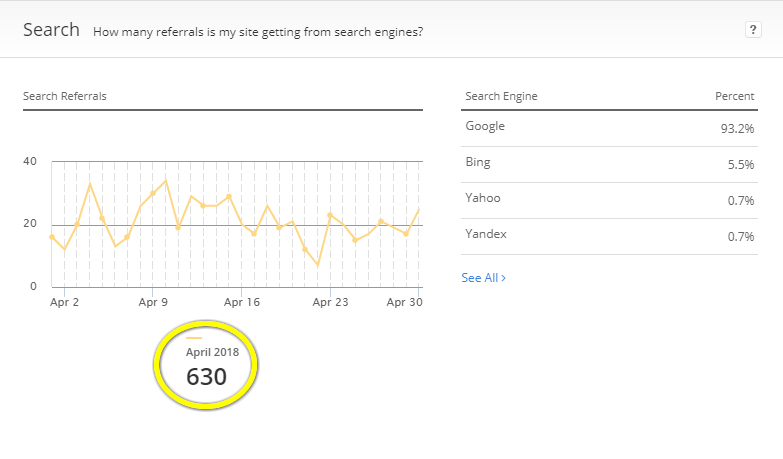 Now, Jim experienced some slight dips in the interim months (as is all in the realm of reasonable fluctuations and seasonality of online traffic), but these are compelling statistics when you gauge his metrics less than six months prior. Although Jim was generating some amazing results from his content marketing and growing his customer base as a result, the required time investment to publish this compelling content was hindering him from fully focusing on the business, which was his ultimate goal. He simply didn’t have the time to do it all. It’s great but I forget. I’m just so busy so I wanted to get someone in there that can just do this right! Seeking to build the momentum he’d gained from blogging, Jim decided to upgrade his subscription to Verblio Complete in February. So along with the optimization service, Owner Built Design now has a full-service account manager who would completely manage its content creation and publishing while providing guidance in their content strategy. And I was certainly up for the challenge! As his account manager, I’m committed to not only helping Jim maintain his online presence but also increasing his already impressive search engine rankings and traffic results. As a lover of all things HubSpot and content marketing, I was ready to delve into his content strategy and take him from BAM to SHABAM! The first step during our initial onboarding call was to discover what his goals were. It was clear that bolstering his website’s analytics was super important to Jim. 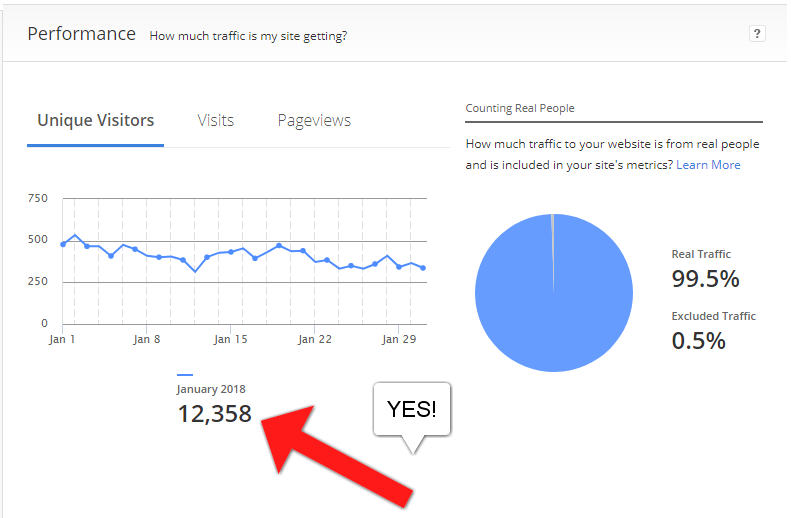 He wanted to continue to dominate his competition through blogging, rise in the search listings, and keep delivering amazing posts to his audience. So, we already knew Jim was doing an amazing job with his content marketing. Yet, to further support Jim’s goals, I honed in on certain areas of his content creation to encourage greater results. First, we focused on niche-related and some low-hanging keywords that his audience was likely searching for. 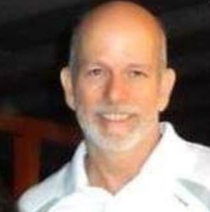 Additionally, Jim focuses on creating awareness stage content that shows homeowners of Oahu that there is someone who offers solutions to their problems and provides what they’re looking for. So whether they’re seeking drafting services or simple DIY and home improvement project ideas, Jim aims to be the go-to brand for these topics and plant the seed that his brand is trustworthy, authoritative, and helpful. Therefore, while keeping his audience questions and pain points in mind, I focused on content types such as how-to’s, checklists, and listicles that typically perform well in the awareness stage. Finally, I also worked on Jim’s blog titles to capture even more attention. This actually proves helpful since the bulk of Owner Built Design’s traffic comes from social media where headlines are crucial for engagement. 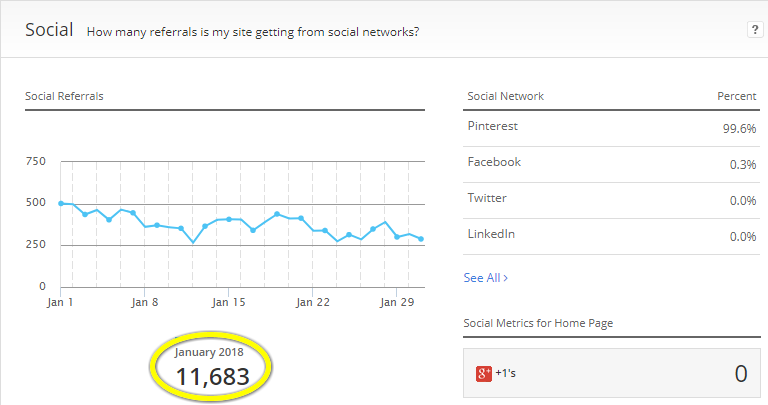 This is a whopping 31.5% increase from his previous website visitors in February! 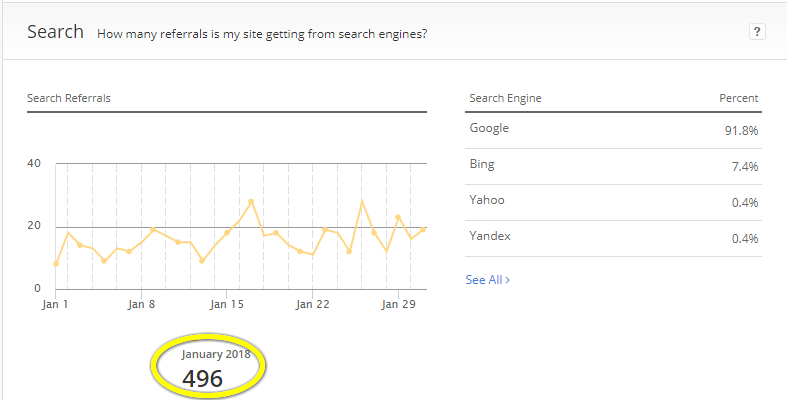 We also noticed a steady rise in organic search traffic the month following. So, leveraging Verblio Complete has shown to be a smart move for Jim to increase his productivity and website traffic while freeing up Jim to focus on aspects of his business more core to his strengths. You see, now Jim spends his time creating drawings of new home additions or remodels, helping homeowners obtain building permits, and fostering relationships with his contractors. You know, stuff he likes to do! Now, when asked what the major advantages were with having an account manager, Jim stated it was the hands-off approach that attracted him the most. I don’t have to be concerned with it. It gives me confidence to know someone’s handling it. I couldn’t give it the time or professionalism. So Jim no longer has to sift through his queue to review articles, ask for edit requests from writers, and accept and publish his own posts. It’s my duty as his account manager to handle the logistics of communicating with writers, ensuring that posts are on-topic, and publish reliably to Owner Built Design’s blog. As a result, Jim has noticed his own time involvement with his content marketing has significantly dropped. This leaves him open to focus more on doing what he does best, all while knowing his content strategy is being efficiently handled and continuing to align with his business objectives. The final and probably most important benefit Jim noted was receiving better quality content published to his blog with Verblio Complete. In addition to ensuring each post is fully polished, edited, and easily formatted to enrich reader-experience, I also build relationships with writers to ensure that they’re a good fit for his content. Through offering consistent feedback, writers gain clarity of Jim’s content goals, style, and tone of voice he wants to convey to his readership. Through these changes, Jim’s bounce rate is slowly decreasing (a change he’s also noticed)! 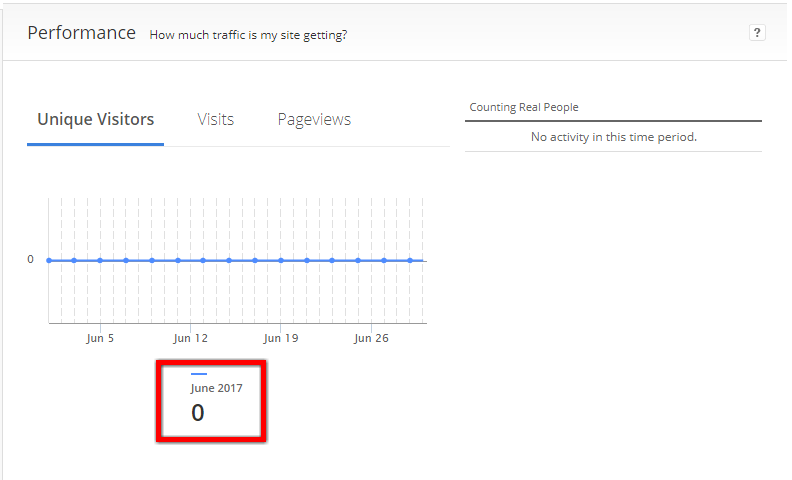 Visitors are staying on his site a bit longer because it’s simple to digest and addresses the questions they’re searching for. This is good news as it works together to better Jim’s organic reach on search…a driving goal for his content marketing strategy. A huge benefit Verblio has offered to Owner Built Design is consistently publishing relevant, high-quality content without sacrificing time for all the other things a small business owner needs to focus on. As a result, he continues to grow his website traffic, online influence, and company revenue. To learn more about how Verblio Complete works, check out this amazing post that highlights yours truly and my colleagues. We are the next best thing since sliced bread! Char Baker is an entrepreneur, content creator, and digital marketer at heart. Earning her degree from James Madison University (Go Dukes!) in Public Administration, Char had no intentions of pursuing a career in marketing or entrepreneurship. Yet, in 2009, she fell in love with the idea of blogging and using digital strategies to create a full-time income from her computer (plus, she's HubSpot Inbound Certified!). When she's not working or writing for Verblio, Char enjoys spending time with the hubby and two boys who are dedicated to keeping mommy busy! You'll also find her treating herself regularly to Maggiano's...and she welcomes any gift certificates.